The range and quality of products you might find in a gallery; the prices you’d expect in a warehouse store… that’s what our customers want and that is what we offer. For over twenty-five years, our framers have helped customers envision and create custom frame designs that bring their art, photography and memorabilia to life. But that’s not all… we offer ready made frames, mirrors and art. All available at everyday low prices that make framing affordable. In fact, we are so confident of our value that we will beat the price quote you receive anywhere on a comparable frame package. Our framers are ready to help you “Show Your Stuff” at 15 Frame Warehouse locations throughout the Carolinas and Virginia. We’re standing ready to inform, recommend and help you create. To find the location nearest you, just navigate to our Locations/Directions page for a complete listing. As the region’s largest provider of picture frames, photo frames and custom framing, we can guarantee the lowest pricing. And that guarantee applies whether you’re framing your family portrait or your child’s latest finger painting. Frame Warehouse provides gallery quality at warehouse prices. Guaranteed. By offering hundreds of selections for standard size ready made frames, custom frames, and matting, Frame Warehouse makes it easy to pick the perfect framing combination. Explore almost unlimited creative options for picture frames, photo frames, framed mirrors, shadow boxes, framed art and much, much more. And if we don’t have it, we’ll get it for you. Our chief goal at Frame Warehouse is to develop relationships with our customers. Period. Small or large. Residential or commercial. We will go the extra mile to ensure your satisfaction on every purchase. Whether we frame one piece or one hundred pieces. And we have your work ready when you want it. Our timetable is your timetable. You can trust our professional framing specialists for a job well done every time. It’s the little things that count, whether you’re choosing ready made frames, or planning a custom framing project. 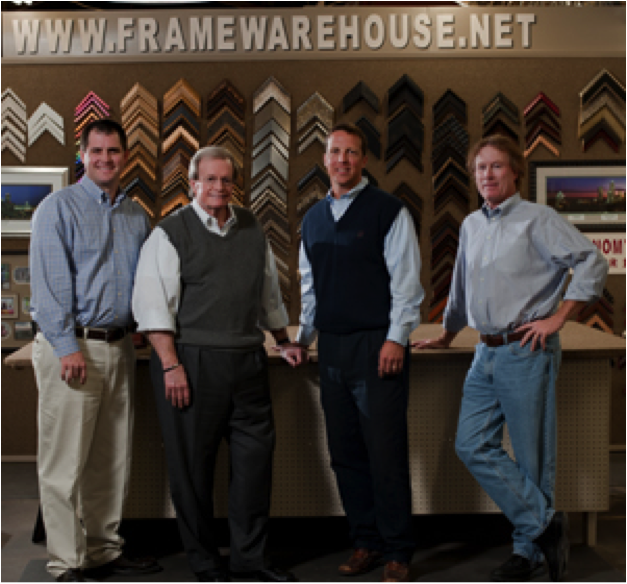 The Frame Warehouse team will help you choose frames that create lasting impressions in your home or business.